Gail packing her bag and leaving Paul. HENRY: Henry Ramsay can handle any little thing! HENRY: Yes he can! And don't forget, it was yours truly who spotted your signal fire and alerted the rescue squad. You might still *be* there if it wasn't for me! HAROLD (rolling his eyes): A fact which I'm sure you'll remind me of until the end of my days! 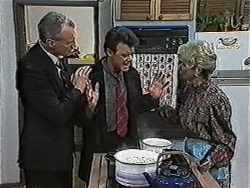 Bronwyn tells Harold not to take any notice of Henry: he's just stirring. 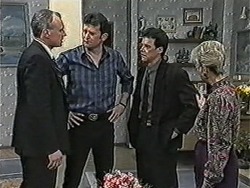 The ‘phone rings suddenly and Bronwyn answers it. She sounds surprised when her father comes on, and tells him that she was thinking about him earlier. She listens and then says she'll look forward to it. She hangs up and tells Henry that that was her dad: he's coming down from Narrabri tomorrow to see what sort of man she's marrying! PAUL: Have you seen Gail? HELEN: Not since she left here earlier. Why? PAUL: She's left me. I found a note when I got home: says that I'm always going to put business before her and the kids. She's blaming me for Rob's death, so she's taken off. 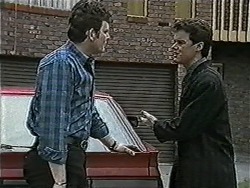 Jim goes and puts his arm on Paul's shoulder and tells him that Gail is upset at the moment; she won't have gone far. Helen suggests that perhaps she's with Gloria, but Paul sighs that she's taken all her clothes; she *means* it. 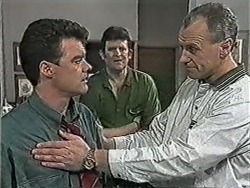 Jim guides Paul through to the lounge room and tells him to sit down while he makes a few ‘phone calls. Paul sits there looking worried. BRONWYN: It's only natural he'd want to meet you. He just wants to make sure that you're honest and hard-working – which you *are*, so you don't have to worry. HENRY (sitting down): Yeah, but I'm probably not the sort of bloke he wants you to *marry*, though, am I? BRONWYN: Well... I suppose not. He always saw me settling down with some farmboy – but that doesn't mean he won't like *you*. Henry asks what they're going to talk about. He adds that if he just knew something about farming, *that* would impress him. Harold chips in that Henry is a gardener: that's not so far removed from farming. Henry, however, pooh-poohs that. Harold then says *he* used to be a stock and station agent: he's got a carton of old copies of the Stock Journal and he could give Henry some pointers about farming. Henry says excitedly that that's a great idea! 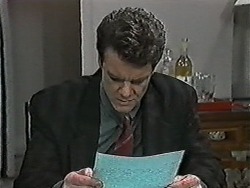 He dashes out to the garage to get the journals, leaving Bronwyn looking worried. PAUL: Just step on it, will you? HAROLD: Where is your head, boy? HENRY (sighs): It feels like it's full of cotton wool. BRONWYN (grins): You mean *lamb's* wool!! HENRY: Do you really think he'll like me? BRONWYN: Course I do! You probably went to a whole lot of effort for nothing. HENRY (uncertainly): Yeah... Can we keep going just in case? HELEN: Oh, I hope she doesn't do anything foolish. HELEN: I can't bear to think of her driving that car. Who knows *what* emotional state she's in? JIM: If you're worried about her repeating Rob's tragedy, you can put that right out of your mind: I know how much she wants the triplets. HELEN: I'm not so sure... This is not just because of Rob's death, you know: there's been a rift brewing between her and Paul for some time. JIM: They had their problems, sure, but no more than other couples. 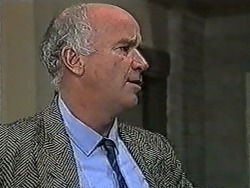 HELEN: Paul's obsession with his work has certainly taken its toll. PAUL: Come off it, will you? She's blaming me for Rob's death. I don't think she's going to sort *that* out in a hurry. HENRY: Bit early to be flogging encyclopaedias, isn't it, bud?! MAN: I'm wondering if I've got the right house. Does Bronwyn Davies live here? I'm her father. PAUL: No – I've been up half the night trying to find Gail. I rang her real father in Tassie – he hasn't heard from her, or so he said, anyway. I even tried contacting Jane in London in case Gail had contacted *her*, but I couldn't get through. JIM: You've got to remember her state of mind, mate. DES: Yeah – just after the funeral and everything, eh? PAUL: Yeah, yeah, yeah – but dad, she thinks that I care more about the business than I do about *her*, and you know that I don't, don't you? JIM: Well, it might have seemed that way at times, but *I* knew it wasn't true. I'm sure that deep-down inside Gail did too. PAUL (presses): But it seemed like that to you? PAUL (looking at Des): You too, mate? DES (awkwardly): Er, well, er, er, a career *can* take over your life, you know, if you're not careful. PAUL: Great. So everyone thinks the same thing. [Raising his voice] Well it damn well isn't true! MELISSA: It's all Hilary's fault: she told mum about us kissing. MELISSA: I don't know. 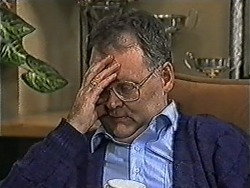 She also said I wasn't in the library during the Sports afternoon. She asked me about it and I had to tell her I'd gone roller skating with you instead. She and dad hit the roof. They think you're a bad influence on me. MELISSA: Todd, I'm not allowed to see you anymore. Todd stands there looking shocked. MR. DAVIES: You couldn't expect *him* to know too much about sheep farming. MR. DAVIES: Oh, I'd rather stay here and learn more about sheep farming from Henry – he seems to know all the facts. Harold sits and squirms in embarrassment. TODD: Why does this have to happen to *us*? MELISSA: I don't know. I'll miss you. The two of them move to the door, where they kiss passionately. Todd then tells Melissa that he'll miss her, too. 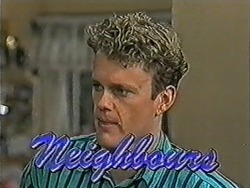 He opens the door and Melissa heads out, taking one last lingering look at Todd as she leaves. HAROLD: Not at all, Gordon. Now, you stay as long as you like. HENRY: So... do you have much of a problem with foot rot? There's an awkward silence. Bronwyn breaks it by telling her father that Henry does lots of things besides gardening: he's actually a very good salesman; and he's good with his voice: he's just done an audition tape for the local radio station. Gordon comments that he *enjoys* the radio: he'd like to hear that. Henry, however, says nervously that he probably wouldn't like *this*. Bronwyn adds quickly that it's for a *younger* audience. Gordon says he'd still like to hear it. Bronwyn tells him that he should realise that there's a lot of difference between country and city radio: it's a lot racier round there. Henry reluctantly goes and switches the tape on. 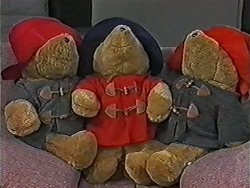 The three of them start listening to his and Clive's efforts. Gordon doesn't look impressed. After a few seconds, he announces that he's heard enough. 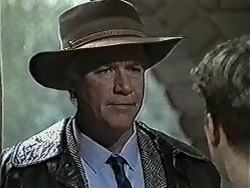 Henry turns off the tape and asks Gordon what he thought. GORDON: You really want to know? HENRY: Well, I'm, I'm interested in your opinion, yes, of course. GORDON: I reckon you're a bit of a twit and you prove it every time you open your mouth. You've got no brains, no prospects and not a hope of marrying my daughter as long as I've got a say in it. Now, that's not an opinion, it's a fact. Henry stands there looking worried.